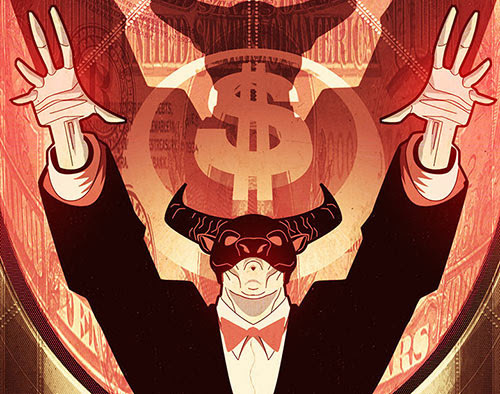 This November, crime pays when Valiant’s viceroys of villainy – the secretive One Percent of Wall Street – step into their very first solo adventure! Valiant is proud to announce ARCHER & ARMSTRONG: THE ONE PERCENT #1 – an all-new one-shot tale spinning directly out of the pages of Archer & Armstrong’s Harvey Award-nominated ongoing series! Arriving in stores this November, join Eisner Award-nominated creators Ray Fawkes (Batman Eternal,Constantine) and Joe Eisma (Morning Glories) as they reveal the secret inner workings of a power-obsessed conspiracy that secretly runs the world from the catacombs beneath the Financial District. They tried to save the Euro, but almost destroyed the world. Thwarted by the adventurers known as Archer & Armstrong at every turn, Valiant’s own wolves of Wall Street then turned their attention to Occupy Wall Street…and we all know how that worked out! Now, in the wake of their greatest victory, a vicious new brand of One Percenter is about to rise to the top of his class, and this time there will be no one to BAIL OUT their enemies as Archer & Armstrong face down a brand new kind of hostile takeover!